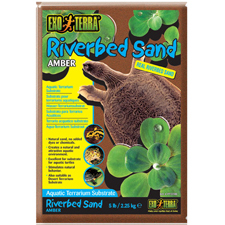 Riverbed Sand is ideal for many types of aquatic turtles as it is their preferred substrate in the wild. Soft-shell turtles especially prefer the find sand for digging and burrowing. 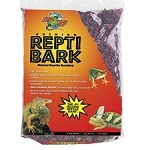 Other types of water and ground-dwelling reptiles, such as frogs and salamanders, will also benefit from Riverbed Sand because of its soft nature. A rough surface, such as gravel, can easily injure skin tissue. Riverbed Sand is very fine and can be easily secreted when ingested, unlike gravel or pebbles which can cause indigestion. Created over time in an African river, Riverbed Sand is extremely fine and round, making it an ideal and safe substrate for the aqua-terrarium. 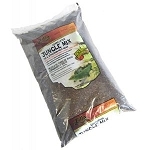 EXO TERRA BIO DRAIN MESH - SMALL 18" X 18"